Are you frustrated with your insurance plan? Have you, or someone you love, been denied coverage? Well here in Pennsylvania, we have new universal health care bill that has been introduced to improve upon the Patient Protection and Affordable Care Act (aka Obamacare) and provide access to healthcare for ALL Pennsylvania residents. I am introducing legislation to establish the Pennsylvania Health Care Plan. Similar legislation has been introduced on at least 3 occasions in the House over the past 7 years. This legislation sets out a blueprint of bold steps that will result in a healthier citizenry at a lower cost with no co-pays, deductibles or premiums or concern about networks and with the freedom and flexibility to choose their health care providers. This legislation is possible because the Patient Protection and Affordable Care Act allows states the option to innovate with their own health care plan as long as the proposed plan is more economical and efficient. This proposed legislation meets that criteria. This option for the states to innovate becomes available in 2017. This legislation improves upon our current health care delivery system in many ways. First and foremost, it preserves the private practice of medicine and the right of patients to choose their healthcare providers. Briefly, the Pennsylvania Health Care Plan is a system in which the Pennsylvania Health Care Agency administers a plan that ensures the cost-effective delivery of covered services that range from catastrophic care to wellness and preventative care. Health Care Providers would have autonomy over patient care. The program will be supported by the savings realized from replacing today’s less than efficient, often profit-oriented, multiple payer system with a streamlined Pennsylvania Health Care Trust Fund. The Pennsylvania Health Care Trust Fund will be funded by a 10% employer tax paid on payroll and a 3% personal income tax. Using our respective Caucuses as an example, we would save millions in health insurance costs if we were to pay an amount equal to 10% of our payroll. A benefit to Plan participants is knowing definitively their healthcare cost exposure for the year. 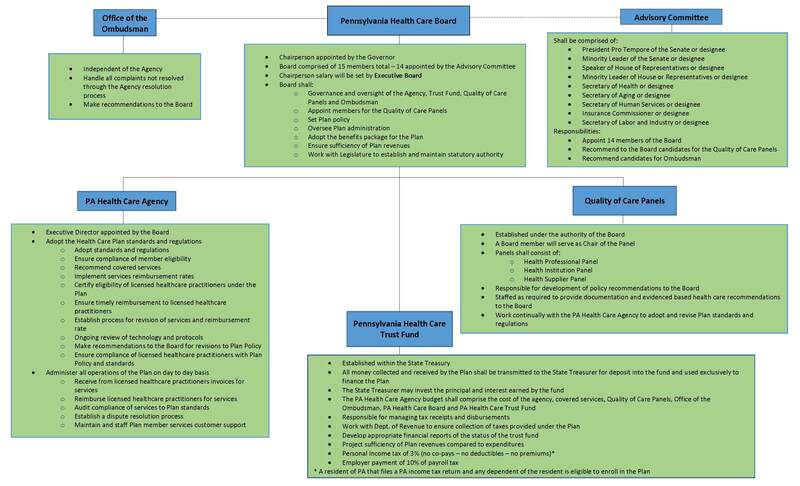 Graphic display of the details of the PA Health Care Plan as presented by Rep DeLissio to her colleagues that she included with her Co-Sponsorship Memo. Give health care providers autonomy over patient care. Eliminates premiums. They are replaced by a 3% tax on adjusted gross income and Businesses will pay a 10% tax on payroll, (most businesses pay far more for employee health benefits, which will be eliminated under this Plan). Benefits businesses by lowering costs for Worker’s Comp, Vehicle Insurance and Liability Insurance due to removal of medical component. Creates this cost savings by replacing our less than efficient, confusing multi-payer system with a streamlined single-payer system. Currently there are four cosponsors of the bill — Rep Pam DeLissio, Rep W. Curtis Thomas, Rep Patrick J. Harkins, and Rep Mark Rozzi. But we need more co-sponsors and citizen calls for passage of this bill. So we need your help. Join us and act now! Contact your state representative now and urge them to support the ‘Pennsylvania Health Care Plan legislation’, this new and innovative health care plan will cover ALL Pennsylvania residents. Find your representative by clicking on this link. Then call, write, and visit your Representative to ask her/him to cosponsor and support an improvement in our health care system here in Pennsylvania. Then share this blog with your family, friends, and business colleagues so that they too can call for this change. Overall, I like it. I am wondering if it includes women’s reproductive health services, such as abortion and contraception. Also, what about people on Medicare? Yes I believe it does it does. I think it also does Medicare, but I’d have to check on that. This bill coupled with the Patient Trust Act should clearly make all medical decisions solely between the doctor and the Patient. Hope this passes. Wish Oregon had a plan like this!